Shopping In Jaipur- An Experience High On Beauty And Quality! excited than me about my tour. After experiencing the royalty of the bygone era by visiting the palaces, forts and monuments in the city, I decided to dedicate one complete day to shopping. There is so much to see and buy at the bustling bazaars of the city. 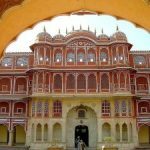 So on your tour to Jaipur, the fascinating city of Rajasthan, don’t forget to pamper yourself with a variety of colorful handicrafts. I explored quite a few markets in the city and finally bought wonderful handicrafts. Famous around the world for its beauty, Blue pottery is one of the special handicrafts of the city. The blue pottery consists of objects like mugs, surahi, jug, plate, tiles, flower pots, ashtray, lamp shades and other decorative articles. A variety of beautiful metal objects are available in the city but the objects carved out of brass are simply unmatched. Lacquered brass and carved brass are the two types of brass work done in the city. You can buy amazing wooden furniture such as table, chair, drawer chest, picture frame, mirror frame, carved doors and windows from the bazaars. Carved in traditional style and available in different shapes and designs, these objects can really give traditional touch to your house. 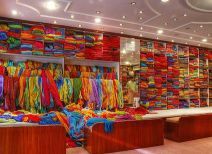 Available in various fabrics, sizes and designs, carpets and durries of the city are famous for their quality and beauty. Shopping in a royal city like Jaipur is incomplete without buying the miniature or folk paintings. Made on various themes, the paintings look awesome. Tye and Dye fabric and Block printed textiles are a big hit in the city. Their grace, color and beauty attract not only Indian tourists but also foreigners. These textiles are available in a variety of patterns. Meticulously carved marble statues of the Hindu deities, animals, human figurines, bowls, vases etc make a good buy in Jaipur.